If you want to be indoor but also want a little bit of sky and fresh air, a patio is what you need. Don’t worry, you don’t need to dig up the backyard and sweat all over to make it perfect. Some small investments on the extended area of your home and you are ready to go. Patios can be located anywhere in your landscape. You can define the area by creating a floor from brick, flagstones, wood chips, grave, or anything that gives it a distinct look or let it simply be on ground level. It’s totally up to you how you want it designed and decorated. We have listed here some patio ideas that can help you jazz up your home outside home. Reach into the secluded areas that are usually overlooked and convert it into a homey welcoming patio for everyone. Choose some handsome furnishings, colourful fabrics and low maintenance plants. You can build a shade over to have some extra privacy too. Adding a path of pavers to your patio can be a good idea if you want to keep it separate from your home and still want to make it look like a part of your home. Pavers comes in many sizes and shapes, so there are innumerable possibilities with the designs. You can choose something to match your exterior to give it a synchronised look, or you can very simply stain the pavers to match the colour of your home’s exterior. Pavers are easy to install and repair, so this is a convenient option if you are on a budget. Keep it simple and cosy. Put some comfortable cushy chairs and a low table for resting food, beverages and of course, books. The chairs wouldn’t always have to be a set, you can mix and match different types of seating options, and it will add a fun look to it. You can also bring colourful cushions to give it a vibrant yet classy look. In case you want to spend less in seating options, you can find ready-to-assemble furniture in lots of styles and shapes. And they are light and easy to move around, so you can arrange it around your small yard with no hassle. Freestanding and table-inset umbrellas will give you the option of cutting the sun’s glare and improving your comfort level. Colour combine the umbrella with the patio’s colour scheme. If the overall look of your patio is subtle and you want to jazz it up a bit, you can pick patterned umbrella fabrics too. Add more shades to your yard putting some plants to it. Low maintenance plants can spare you some time, you can also go with flowers or vines. Some foliage can help you blend the whole look together. For night time relaxation in patio, you need to arrange some lighting over there. Putting up lamps or covered lighting fixtures can give your patio a night-time mystic look. For a more eco-friendly option, you may choose CFL and LED lighting, they will also save you some money on your monthly utility bill. 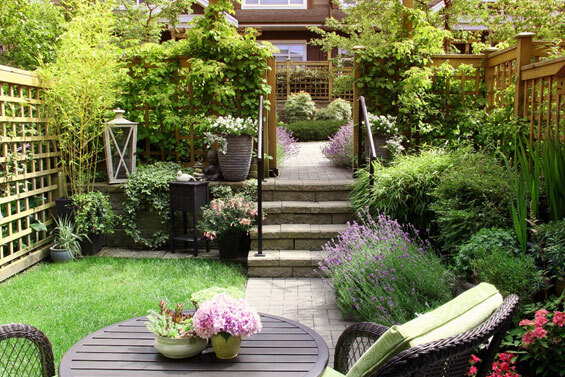 These are some basic ideas to make your yard feel like home. If you are thinking of giving it an expert finesse you can always install a deck for the floor or a pergola as the shade. MTB Carpentry and Construction can help you with that. Call us to know all your option for the perfect patio you always dreamed of.